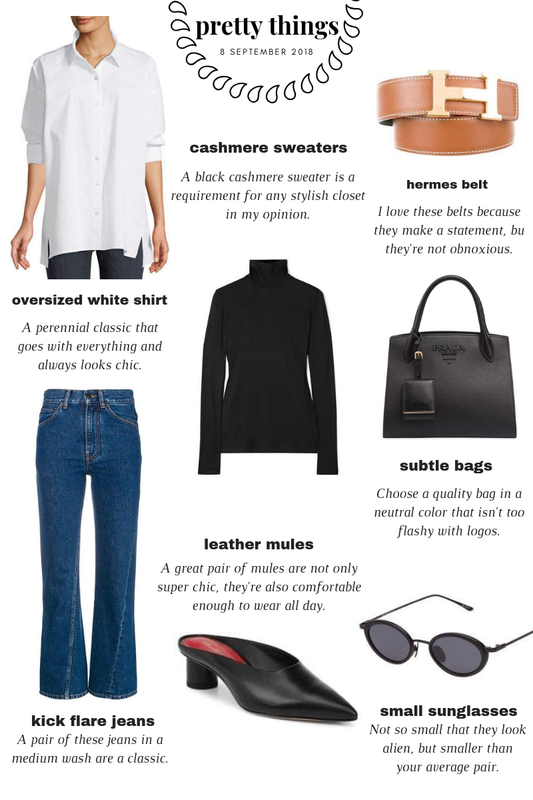 My best friend Caroline just wrote a post about her fashion icon Carolyn Bessette Kennedy that I have to share with you all. I, too, love CBK's chic, timeless style and thought she would be the perfect inspiration for this weekend's edition of pretty things. A lot of CBK's style, while timeless, has its roots in nineties fashion which we all know is back. Luckily, that means finding these pieces will be super easy. A menswear-inspired, slightly oversized white oxford shirt is such a classic piece. You can dress it up or down and it will literally never go out of style. A great quality black cashmere sweater like this one from Akris is another piece that will level up your wardrobe. Using belts like this one from Hermes are a perfect way to make even the most casual look feel more luxurious. Designer bags are great for their quality and clout, but be sure to pick a style that's timeless and isn't covered in logos. I love a classic black Prada bag. As we all know, the tiny sunglasses of the nineties are back in full swing. I don't think they're the most 'classic' choice per se, but since they've made a comeback, why not give them a try? A great pair of slides are such a good purchase. They're chic and add a little bit of edge to a look, but they're also super comfortable. In most photos you see of CBK, she's wearing khakis, cords, a black skirt, or a pair of kick flare jeans like these. Pair this type of denim with an elongating shoe like a strappy sandal, stiletto, or slip-on mule.